We provided complete architectural services for a new 1,700s.f. 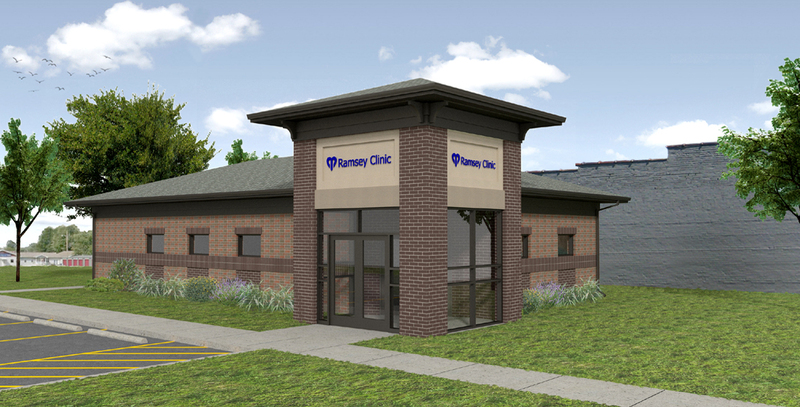 medical clinic in Ramsey, Illinois. Spaces include a waiting area, reception, nurse’s station, exam rooms, doctor’s office, drug storage, general storage, kitchenette, restrooms, and mechanical room. Owner budget restrictions required cuts to the overall construction cost, and we successfully eliminated exterior design features to allow the project to proceed. We also provided architectural services for a 2,700s.f. interior renovation of the existing Medical Mall in Pana, IL. The existing mammography suite was remodeled to relocate a reception office and create a new lounge. A new reception office was added to an existing waiting room, and second floor patient rooms were updated to meet bariatric and accessibility standards. We also provided architectural services for a new office building in Pana for Durable Medical Equipment & Home Health, which included a display area, reception desk, conference room, five offices, thirteen work stations, and a kitchenette.